SicKnitter: Was the Bard a Bigot? Opera singers have long played Verdi's "Otello" in dark makeup? How did Shakespeare present his Othello? I was excited to plan my second annual excursion to the Utah Shakespeare Festival, but less than thrilled with the choice of plays. Why did they present the two racist plays on the same year? Fortunately our only comedy came first, "Merry Wives of Windsor." It was sweet and silly, set in turn-of-the-century America and punctuated by barbershop quartet numbers. This Elizabethan Drama actually passes the Bechdel Test, with two middle aged female leads who talk about their children as well as about the greedy, lecherous drunk they work together to bring down. There are jokes at the expense of the French, in the form of a doctor who can't pronounce words understandably, and the Welsh, through a clergyman who often uses the wrong word. But apparently I haven't been raised to feel sensitive about the feelings of those groups, despite a good dose of Welsh DNA. "Othello" worried me most. I had read it in college and found it too painfully tragic to cope with. 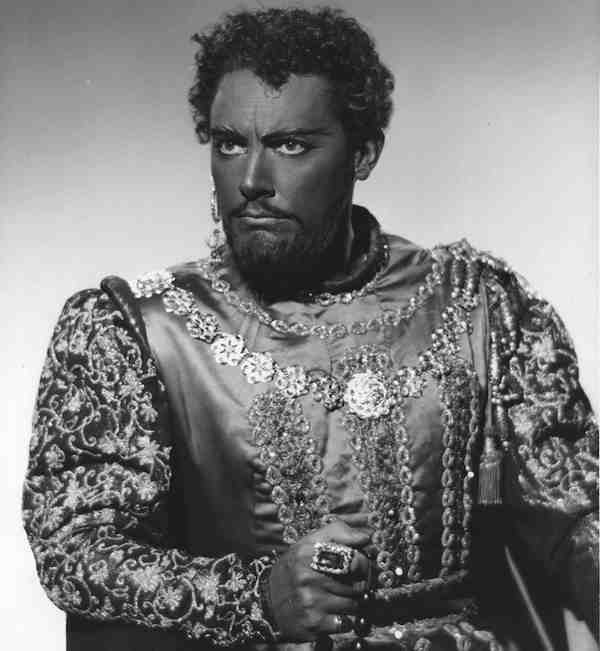 I also saw a film version of the opera "Otello" with Pavarotti in what could best be described as "red face," really bad makeup that made him look more like all the blood had rushed to his head than like he was from Northern Africa. So armed with expectations of racism and domestic violence, I tentatively entered the intimately-sized theater chosen for the performance. Despite this photo, Iago is rarely in the shadows. He controls the show. I think it was the best of the three performances we saw. Wayne T. Carr brilliantly portrayed the charismatic Othello, a confident soldier slowly goaded into tortured insecurity and murder. But the star was Brian Vaughn as the villain, Iago. We spent most of the play inside Iago's head as he plans to manipulate everyone around him to accomplish his ambitions of military advancement and his personal vendetta against Othello. Because I was watching for it, I noticed that all the racial slurs in the play come from Iago. Everyone refers to Othello as "the Moor," but it doesn't seem to be out of disrespect. The other character who showed dislike for Othello was his father-in-law. Apparently Desdemona's father suspected nothing until she eloped. We don't know if race, rank, or money was the reason the couple didn't ask for permission. When Brabantio complained to the Duke about his daughter's marriage, he was told to accept the couple because Othello was crucial to the safety of Venice. Shakespeare doesn't give Desdemona enough lines to explore domestic violence and why women stay. When Othello begins to suspect and mistreat Desdemona, everyone who knew him shows absolute shock because the behavior is so contrary to his nature. The ending was as horrible and sad as expected and I left the theater wanting to wash the evil scheming of Iago out of my brain. "The Merchant of Venice" is a weird blend of comedy and racism. When I first read the play in college, I assumed Shakespeare created Shylock, the Jew, from old folklore. Jews had been expelled from England several hundred years before, maybe they hadn't come back yet. During the pre-play introduction we learned that "Merchant of Venice" may have been anti-Jewish propaganda. Queen Elizabeth had a trusted Jewish physician. As she started preferring his advice over that of some of her official advisors, they took action against him by paying popular playwrights to stir up anti-Jewish sentiment. Eventually, when the queen went out of town, they quickly arrested and executed the doctor. Some scholars think Shakespeare was already writing the romantic comedy side of "Merchant of Venice" and added the Antonio/Shylock conflict to fulfill a commission. Whatever Shakespeare's intention, the director, Patricia Anderson, made the Jewish characters in the play completely sympathetic. We see Antonio's friends (played by a multi-ethnic cast) violently abuse Shylock on the streets. His anger at these people who abuse him and steal his daughter is understandable. The audience is torn between our expected sympathies for main characters and feelings of repugnance toward their words and deeds. Although no one in the audience wants Antonio killed, I think most of us would have been happy to see Shylock get away free after his claim is denied. Instead he is jailed and forced to convert to Christianity. All the while, Jessica, Shylock's daughter is shown regretting her choice. Conversations with her husband quickly turn into arguments. She tries to pray by crossing herself and finds the gesture unsatisfying. 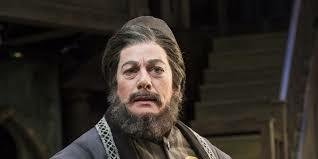 While Shylock is stripped of traditional Jewish clothing and a cross is put around his neck, Jessica, far away in Portia's house, is in a quiet corner rocking and reciting a Jewish prayer. The casting of this play was interesting and fun. Bassanio, Portia's successful suitor, is played by Wayne T. Carr, star of Othello the night before. 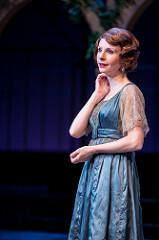 Portia, Tarah Flanagan, is one of the Merry Wives from two days ago. These are professional actors, but my mind spins at the thought of remembering two leading Shakespearian roles at once. And they likely appear in in some of the plays I didn't see. 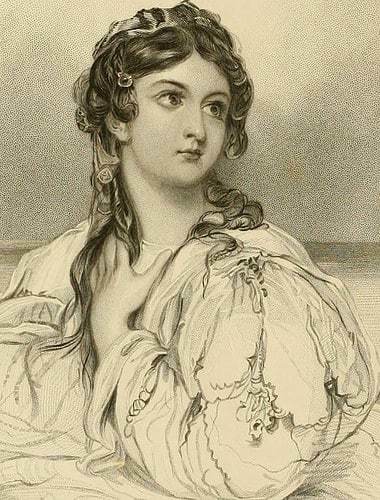 Casting characters with more thought for talent than race has long been the tradition in Opera and Shakespearean performances, but Anderson also cast some parts contrary to gender. Just as Shakespeare used boys and men to play women's roles, Anderson cast three women in men's roles, including the title character, Antonio. I noticed, but it did not at all distract from the story. Next year features Macbeth, Hamlet, and Twelfth Night, all plays I know and love well. I'm looking forward to it, but wondering if I can find a less painful way to travel or a better recovery plan. So as to my title, was Shakespeare a bigot? To some degree he probably was. We are all raised with the prejudices of our environment, surely he was not too unlike other Elizabethan Englishmen. But because Shakespeare gives all of his characters depth and motivation, it's hard to tell simply by his words. We would probably have to see Shakespeare direct these problematic plays to get a sense of his feelings. THE PODCAST--I am back on track and talking about a poem that sounds like Emily Dickinson is ready to march into battle. It was written during the beginning of the Civil War and probably caught my eye because I am currently listening to the Civil War podcast (which I would highly recommend). The likely agoraphobic Emily is all talk in "Unto like Story--Trouble has enticed me," just like I am when it comes to politics. Neither of us are physically able to march into trouble for a good cause. I am thankful that, unlike women in the 19th century, I can at least vote. And unlike Emily, I am not afraid to publish. THE KNITTING remains slow because I am not supposed to do much of it if I want to get my aching left arm back. I've reluctantly taken up coloring to pass the time when I want to knit. I've also finished another hat. 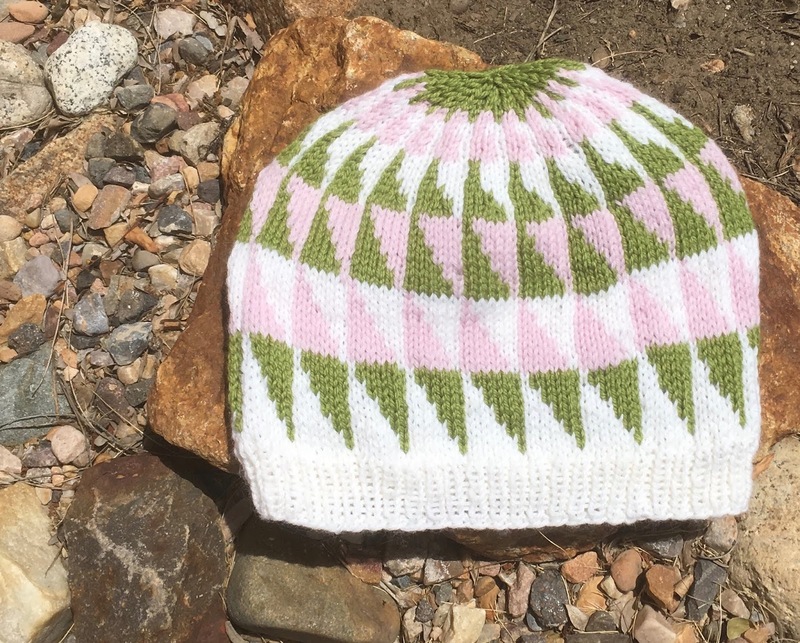 Like the previous hats, it will be in my shop when I get on the ball and get Etsy caught up. LIFE is stressful. We have a date for my disability hearing now--October 2. Our family has to change to my husband's insurance on September 1 and we may have to go on COBRA in January because his layoff is scheduled for December 28. With that much up in the air it is hard not to feel stressed and stress exacerbates all my symptoms. I'm not sure when I'll be back to normal or if I need to accept current levels of pain and lack of energy as my new normal. My normal range is 3-8. I've been spending a lot of time at 7 lately.